Though the title of this very blog may lead one to suppose that the processes of human thought, feeling and behaviour are “All in Our He ad” this, in fact, couldn’t be further from the case. The human brain is directly and intimately connected with the body of the human organism. We think what we think, feel what we feel, we are who we are and do what we do both because our brains are wired up in a particular way and because our bodies are configured and composed in a unique manner. Last night I took to the cinema to see the recently released action movie “Lucy”. I was well aware of the glaring falsity that made up the premise of the plot–the fictitious idea that we only use 10% of our brains at any one time–before even entering the cinema, but had convinced myself I could ignore this little annoyance and enjoy the action, acting and directing in and of itself. Playing a college academic, Freeman utterly and unconditionally betrayed my faith in him as Hollywoods’ emblem of wisdom, insight, goodness and understanding. 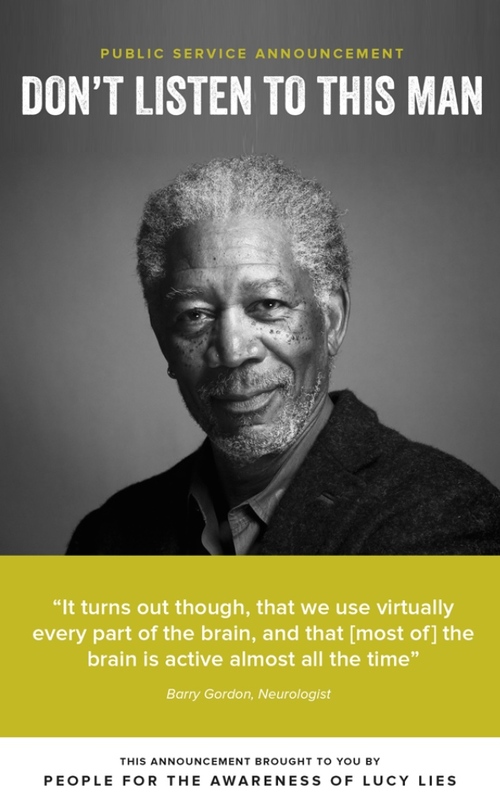 Somehow the words “imagine what we could do if we unlocked the full potential of our brains” were all the more excruciating when emanating from the knowing, dulcet timbre of Freeman’s voice.